Cancer can begin in any organ or tissue of the body. The original tumor is called the primary cancer or primary tumor. It is usually named for the part of the body or the type of cell in which it begins. 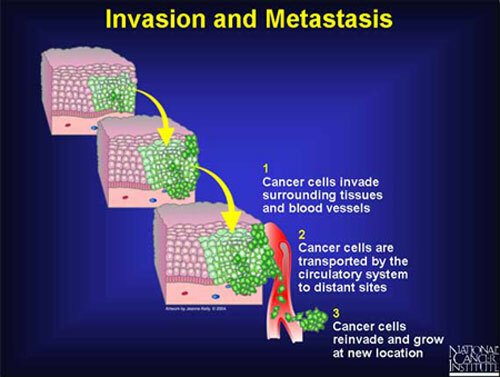 Metastasis means the spread of cancer. Cancer cells can break away from a primary tumor and enter the bloodstream or lymphatic system. That is how cancer cells spread to other parts of the body. When cancer cells spread and form a new tumor in a different organ, the new tumor is a metastatic tumor. The cells in the metastatic tumor come from the original tumor. This means, for example, that if breast cancer spreads to the lungs, the metastatic tumor in the lung is made up of cancerous breast cells (not lung cells). In this case, the disease in the lungs is metastatic breast cancer (not lung cancer). Under a microscope, metastatic breast cancer cells generally look the same as the cancer cells in the breast. Cancer cells can spread to almost any part of the body. Cancer cells frequently spread to lymph nodes near the primary tumor. This is called lymph node involvement or regional disease. 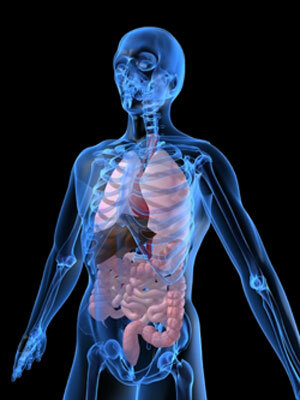 Cancer that spreads to other organs or to lymph nodes far from the primary tumor is called metastatic disease. Doctors sometimes also call this distant disease. Prostate cancer tends to spread to the bones. Breast cancer commonly spreads to the bones, lungs, liver, or brain. However, each of these cancers can spread to other parts of the body as well. Are there symptoms of metastatic cancer? x-rays and other tests performed for other reasons. Cancer that spreads to the bones is likely to cause pain and can lead to bone fractures. Cancer that spreads to the brain can cause a variety of symptoms, including headaches, seizures, and unsteadiness. 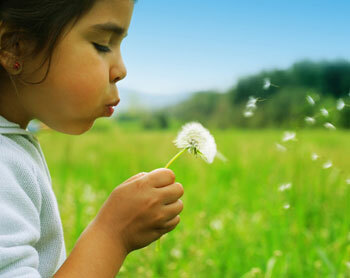 Shortness of breath may be a sign of lung involvement. Abdominal swelling or jaundice can indicate that cancer has spread to the liver. Sometimes a person’s primary cancer is discovered only after the metastatic tumor causes symptoms. For example, a man whose prostate cancer has spread to the bones in his pelvis may have lower back pain (caused by the cancer in his bones) before he experiences any symptoms from the primary tumor in his prostate. To determine whether a tumor is primary or metastatic, a pathologist examines a sample of the tumor under a microscope. In general, cancer cells look like abnormal versions of cells in the tissue where the cancer began. Using specialized diagnostic tests, a pathologist is often able to tell where the cancer cells came from. Markers or antigens found in or on the cancer cells can indicate the primary site of the cancer. Metastatic cancers may be found before or at the same time as the primary tumor, or months or years later. When a new tumor is found in a patient who has been treated for cancer in the past, it is more often a metastasis than another primary tumor. No. 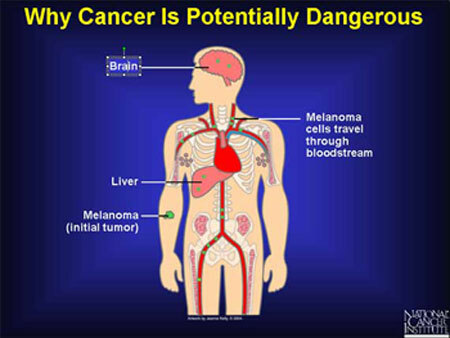 A metastatic tumor always starts from cancer cells in another part of the body. In most cases, when a metastatic tumor is found first, the primary tumor can be found. The search for the primary tumor may involve lab tests, x-rays, and other procedures. However, in a small number of cases, a metastatic tumor is diagnosed but the primary tumor cannot be found, in spite of extensive tests. The pathologist knows the tumor is metastatic because the cells are not like those in the organ or tissue in which the tumor is found. Doctors refer to the primary tumor as unknown or occult (hidden), and the patient is said to have cancer of unknown primary origin (CUP). Because diagnostic techniques are constantly improving, the number of cases of CUP is going down. When cancer has metastasized, it may be treated with chemotherapy, radiation therapy, biological therapy, hormone therapy, surgery, cryosurgery, or a combination of these. The choice of treatment generally depends on the type of primary cancer, the size and location of the metastasis, the patient’s age and general health, and the types of treatments the patient has had in the past. In patients with CUP, it is possible to treat the disease even though the primary tumor has not been located. 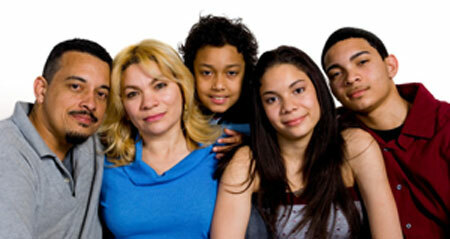 The goal of treatment may be to control the cancer, or to relieve symptoms or side effects of treatment. As new and better treatments are developed, people are living longer and with a higher quality of life. As with primary treatment, each person must make his or her own decision as to which type treatment best fits his or her individual risk/benefit level. How many side effects are you willing to encounter for what benefit? Just like we don’t know where the wind will carry seeds, doctors sometimes don’t know if, or when someone will recur with cancer. Your doctor can give you your odds for recurrence. Look at odds as the glass half full instead of half empty so if your doctor says there is a 70% chance of recurrence, you think of yourself as being in the 30% who will beat it. If you do recur, remember, your doctor can treat you and give you survival odds but these are statistical numbers, you are not a statistic. Live life your way! For more information about our e-Training courses, please read the e-Quiz Introduction. Copyright © 2006-2013 CISN - All Rights Reserved.